Follow news and fund ratings from the world's largest fund rating agency in terms of the number of fund analysts contributing to its ratings. 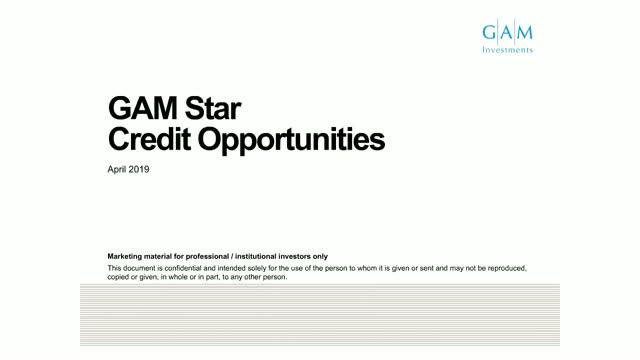 On SharingAlpha's 'Meet the Managers Program' we will be hosting Jeremy Smouha, Fund Manager of the GAM Star Credit Opportunities Fund. Jeremy will talk about the opportunities he sees in the Credit Markets and will be answering questions from the audience. On SharingAlpha's 'Meet the Managers Program' we will be hosting Ygal Cohen and Steven Groslin, Fund Managers of the LFP-ASG Dynamic Income Fund. They will talk about the opportunities they see in the Subordinated Debt Securities market and will be answering questions from the audience. On SharingAlpha's 'Meet the Managers Program' we will be hosting Ryan Barksdale, Senior Investment Analyst of the Vanguard Global Emerging Markets Fund. He will talk about the opportunities he see in the EM equities markets and will be answering questions from the audience. On SharingAlpha's 'Meet the Managers Program' we will be hosting Alex Araujo, Fund Manager of the M&G Global Listed Infrastructure Fund. Alex will talk about the opportunities he sees in the Infrastructure Sector and will be answering questions from the audience. JB Beckett, Author and Founder of New Fund Order, will provide his questions and insights during the webcast. On SharingAlpha's 'Meet the Managers Program' we will be hosting Jacob Ellinge Nielsen – Senior Portfolio Manager and Thomas Thorkild Haugaard – Senior Economist to talk about their leading Emerging Markets Debt Hard Currency strategy. Jacob and Thomas will talk about the opportunities they see in the Emerging Markets and will be answering questions from the audience. - Do quantitative ratings add value? - How to become a fund selector? - Why we aren't seeing too many female fund selectors? Leading insights from SharingAlpha's growing community of professional fund buyers.